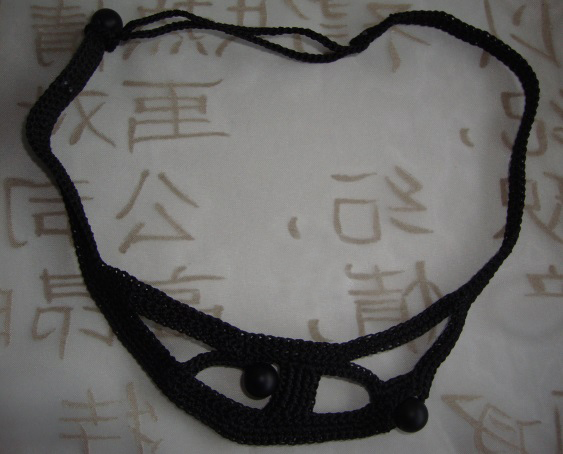 Recently I’ve made several crochet necklaces as presents. Some of them were made of 100 % crochet thread, but most were completed of 100 % microfiber thread like this http://www.yarn-paradise.com/tulip Microfiber is a shining thread and its colour won’t fade with the time as can happen with 100 % cotton thread. But you will need some patience with it because microfiber is quite slippery and all ends should be fastened properly before cutting off. This is my favourite necklace because of its laconic style so it can be worn with many dresses. No fastener was needed, just some 100 % microfiber thread and 3 beads. I forgot the name of the black semi-precious stones the beads were made of, so next time I meet a geologist, I’ll certainly ask him :)). Pass through all beads you are going to use in the necklace (take a needle or just insert microfiber thread through all beads). 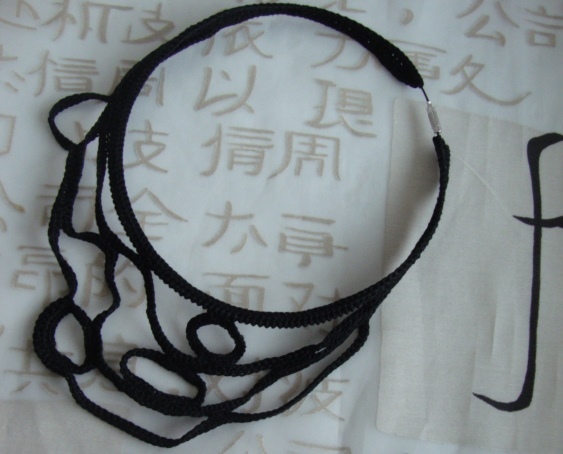 Then using small hook (1.5 mm) make foundation chain of the length of 50 cm (19.7’’). All other rows will be crocheted with smaller hook 1-1.2 mm. In the next row work 1 sc into each sts up to the centre of the foundation chain, then work 10 sc over next 10 chains and place the first bead. The foundation chain will be at the bottom of the necklace (that is why the length of the necklace is wider than the width of my neck). Chain 3 over this first bead, join the last chain with the foundation chain and continue working sc stitches to the end of the foundation chain. Turn, work sc stitches backwards over the other side of the foundation chain up to 3 ch made over the first bead. Here turn again, chain 14, join the last chain with the tenth stitch counting from the bead to form the first empty triangle. Turn, work 5 sc over the first 5 ch, turn, work 5 sc backwards, join the last sts with the foundation chain, turn, work 5 sc backwards, again turn and work 5 sc towards the foundation ch, join the last sts with it. These 4 vertical rows of 5 sc are in the centre of the photo. Then chain 3, place second bead (next to 4 vertical rows in the photo) and chain 7, join last chain with the foundation row and continue working sc stitches in the same direction over foundation row. At the end chain 7 and place the third bead that will be used as a fastener. Join last chain with the necklace. Turn, work sc stitches backwards over all recently made chains up to 3 chains made over the first bead (you will need to chain 3 over the second bead). Work 10 sc counting from the first bead, turn, chain 12, join with sc sts over the first triangle (you made another triangle), work 1 sc backwards towards the bead-fastener at the end of the row. On the way after the second bead chain 15 to make the last empty loop, turn and work sc sts back and forth over 15 ch only. Afterwards crochet to the end of the row towards bead-fastener. 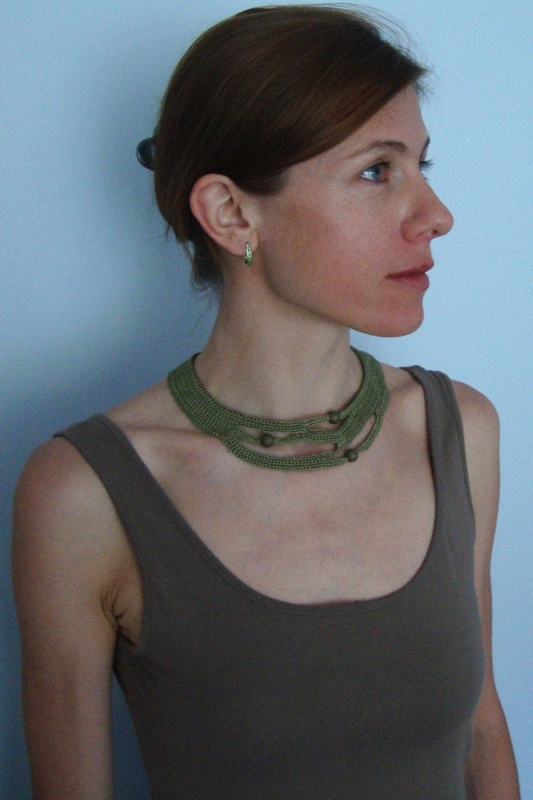 There turn and crochet backwards – this time all way to another end of the necklace. 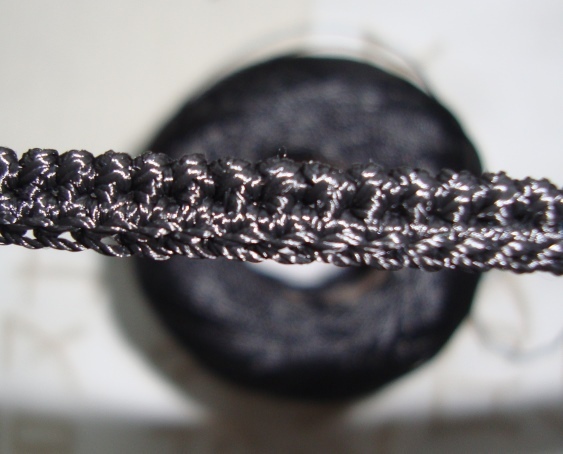 Make a loop that will be used as a buttonhole – work chains and in the next row – sc stitches over chains. 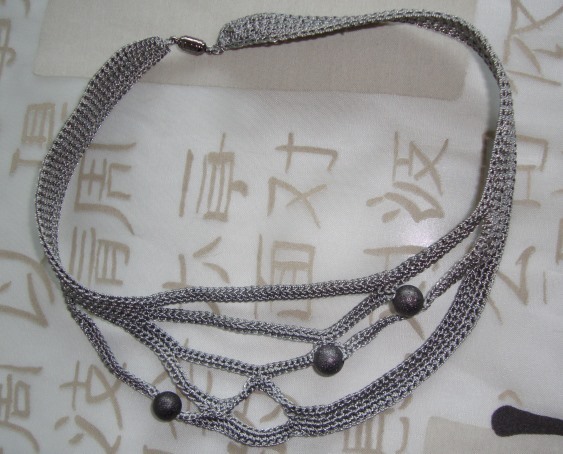 Second grey necklace was made with basalt beads. Basalt forms when lava reaches the Earth’s surface at a volcano or mid ocean ridge, they are a great texture for natural designs. Metaphysics think that basalt assists with emotional tranquillity, stability and patience, offers a sense of peace, helps to allow creativity to flow through the user. I have no particular belief about stones but I agree that one can make creative things with them :). Here again you pass through all beads you are going to use in the necklace. The length of the foundation chain should be of the width of your neck plus some ease. Usually I use bigger hook for the foundation chain and 1-1.2 mm hook for other rows. Every triangle is made by chaining and then working sc stitches over chains. The basalt beads are bigger, therefore I chained 4 under each. 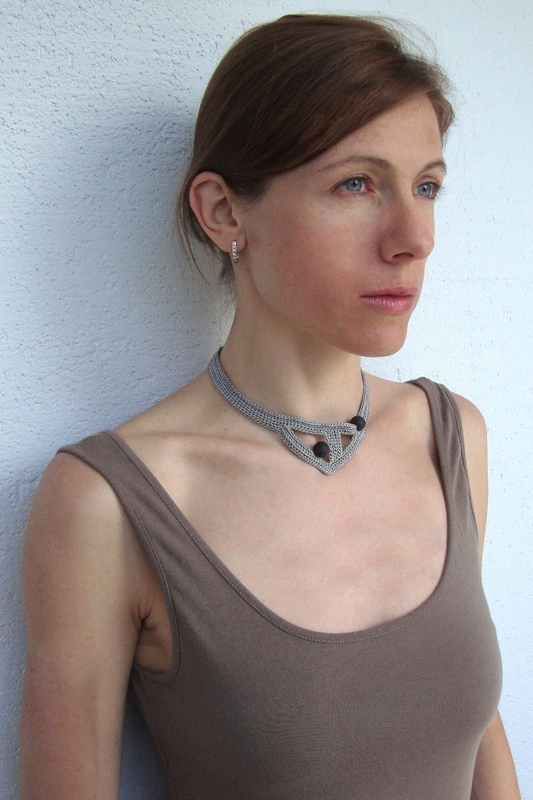 The grey necklace is also suitable for many simple garments. 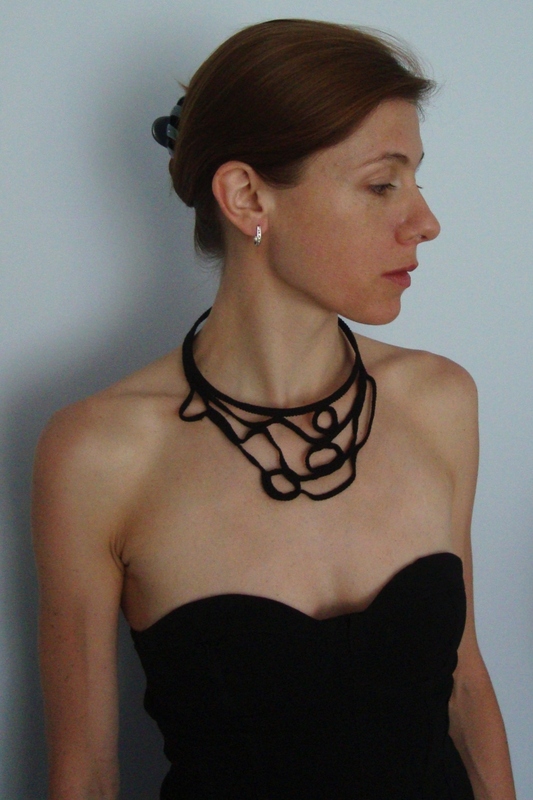 For this black necklace you will need a round wire necklace with fastener. 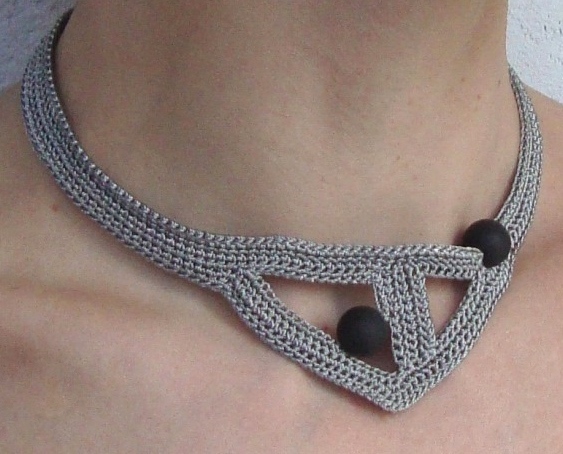 Using 100 % crochet thread work sc stitches to cover wire necklace completely. Then work crab sts – reversed sc sts from left to right. In the photo you see scalloped edge under the first “wire” level. Set this part apart and prepare 3 crochet rings. For the first ring chain 15, place 25 sc into the ring and finish. For each of two other rings chain 20, place 30 sc into the ring. Now take the first “wire” level, crochet ribbons and simultaneously attach crochet rings between crochet ribbons. Each ribbon is a new foundation chain with sc stitches over it. Make sure the whole construction lays freely in front and is not stiff. 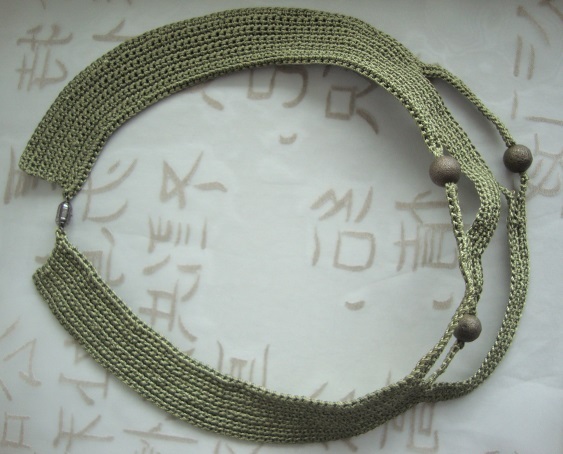 Other necklaces: grey was made with hematite and green was crocheted with some interesting beads but I again forgot their name :). Green microfiber has an interesting ability to change its colour depending on the light.